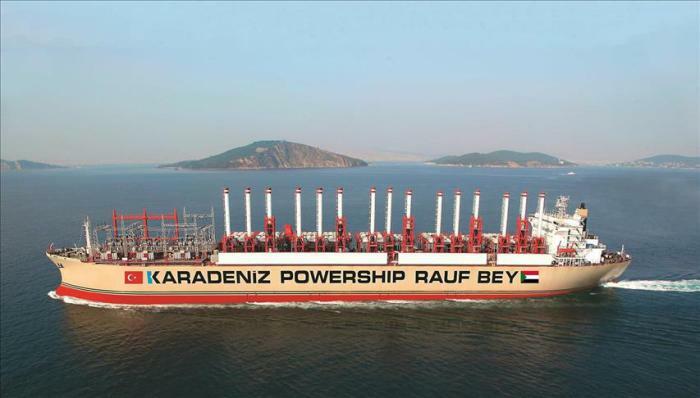 Turkey’s floating power plant, the Karadeniz powership Rauf Bey, started electricity production in Sudan, a member of the Istanbul-based Karadeniz Energy Group, Karpowership, announced Tuesday. The powership, which has 180 megawatts (MW) of installed capacity, will supply 150 MW of power to Sudan’s national energy grid. The plant is important for the stability of the country’s national grid as it caters for the country’s increased energy demand. The company announced on April 27 that it signed an electricity production and sales agreement with Sudan’s electricity company, STPGC. Karpowership is the sole owner, operator and builder of the first powership fleet in the world. Since 2010, 15 powerships have been completed with total installed capacity exceeding 2,800 MW. An additional 5,000 MW of powerships are either under construction or in the pipeline. African nations desperately need energy to develop their economies, build industries, and to expand their agriculture and manufacturing sectors. With hundreds of additional gigawatts of power, the continent can be transformed; hunger and poverty can be eradicated . Energy is an essential category of infrastructure that every nations needs to achieve higher levels of economic growth. Africa should have nuclear energy, and floating nuclear power plants can contribute to supplying power to the continent. I have been advocating this idea for decades, and now its time has come! May 22, 2018—With great ceremony, the Russian city of Murmansk welcomed the floating nuclear plant Akademik Lomonosov on May 19. The plant had traveled from St. Petersburg where it was built. It will receive its supply of nuclear fuel in Murmansk, and then proceed to the Arctic circle town of Pevek, where it will begin to supply power to the population of approximately 50,000 people in the area next year.